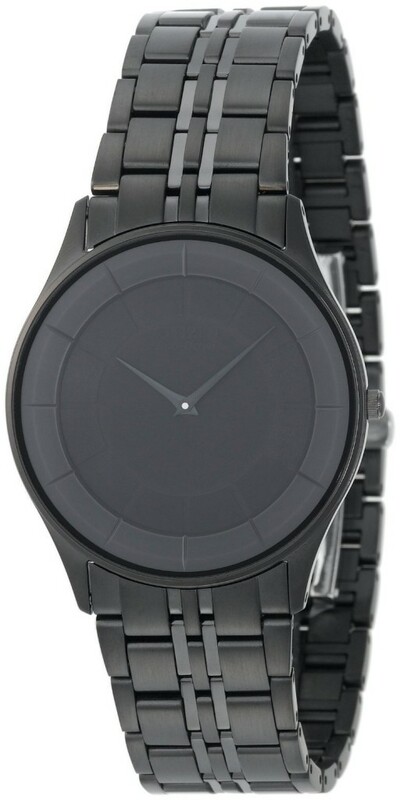 The Citizen Men’s Eco-Drive Stiletto Black Ion-Plated Watch offers a confident look with its all-black design. The silky black dial is simple with notched hour markers and sleek, black hands. The stylish band is made of stainless steel with contrasting sections of polished and matte finishes. Scratch-resistant sapphire protects the round dial, and Japanese Quartz movement is solar-powered and will never need a battery. A one-hand deployment clasp is quick to remove, but confidently secures the watch on your wrist, and the piece is water-resistant up to 99 feet. Citizen Men’s Eco-Drive Stiletto Black Ion-Plated Watch: The creative distinction of this watch has an immediate and mesmerizing effect. Its utterly stunning design features a bold face with light powered Japanese-quartz movement and chameleon like characteristics going from natural sunlight to indoor lighting. The hour markers are minimalistic in design and create a completely unique statement in style. The dial’s exquisite hands are decisive and edgy, complemented by a black band that features quick one-hand fastening. The Eco-drive technology is a light absorbing crystal with proven power and reliability and this magnificent watch is water-resistant to nearly 100 feet. This decisive and classic timepiece goes very well with confidence.